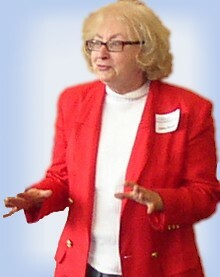 Cathy Goodwin, Ph.D., is a professional speaker offering talks, presentations and workshops. Cathy combines fast-paced, information-rich content with her own brand of unique irreverence. Her infectious energy and easygoing style will engage your group members, meeting them when and where they’re coming from. Cathy speaks for a fee to organizations that attract service professionals, such as service business owners, consultants, authors, speakers, trainers, financial service providers, lawyers, and coaches. Her specialty is delivering solid content with engaging style and humor. She’s happy to speak at organization meetings, webinars and podcasts. She also participates as a guest on podcasts and will negotiate a complimentary appearance with a non-profit group. Cathy holds a PhD in business (specializing in marketing), but she probably doesn’t fit your memories of the college professor. She uses humor (she’s done a stint as a stand-up comedian) and story-telling. Here’s an unedited video of a 5-minute informal presentation from a local tech group, where everyone was limited to 6 minutes and 10 slides. Get an entertaining, information-packed introduction to four ways you can use storytelling to build your brand and your business. Discover the success factors to business storytelling and gain an appreciation for the specific requirements of a business story (hint: it’s not a fairy tale, campfire story or a bedtime story). You’ll come away with the four essential ways to promote your business with storytelling, tips to become a storytelling ninja and a roadmap to match each story to your business goal. This question strikes fear into the heart of most business owners. Should you bring up the story of how you chose to start this business…even when you just fell into it by luck? Must you bare your soul by sharing your struggles and pains? What’s the best story to present yourself as an authority without coming across as boastful or arrogant? 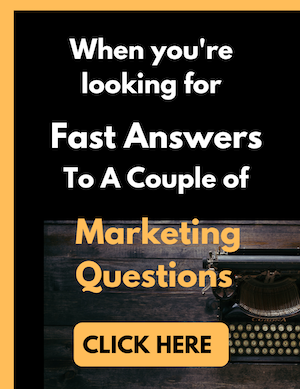 In this talk, you’ll discover the best way to answer this question for your business — and how to craft your answers based on who’s asking and why. You’ve probably heard of the traditional brand story archetypes, like “Voyage and Return” or “Conquering the Monster.” These classics resonate with readers all over the world, yet many business owners won’t relate to them when developing their own stories for branding. Discover the five archetypes that the most successful small service-based businesses use and learn how to identify the archetype that best represents your business. Identifying your business story archetype will simplify the process of developing, building and marketing your small business brand and message. Are you hearing a lot about storytelling and wondering how it can help your business? This interactive presentation demonstrates how any business can attract more clients through story-centered marketing. I work live with three (or more) business owners who volunteer for the “hot seats.” You will follow the process I uses to help business owners and independent professionals find stories that will deliver the best results for their business. Finally, you’ll get a summary of the st eps so you’ll be able to apply this simple, fun method to your own business. This presentation walks you through the steps to develop a contemporary website that attracts clients, smoothly and efficiently. We’ll take the overwhelm out of web development and introduce you to shortcuts that save you time and energy, without sacrificing quality. Discover how to choose and work with design and tech teams, so you get your website finished and ready to receive clients, as quickly and smoothly as possible. And you’ll get some copywriting tips to write more easily, especially if you’re battling “I hate to write about myself”syndrome. If you would like to book Cathy Goodwin for a speaking engagement, or if you have questions, please complete this contact form. Dr. Goodwin is brilliant at explaining how to effectively use storytelling in marketing small businesses. She has been an exemplary presenter for the Small Business Center and is very skilled at presenting the information in a clear and effective manner online. She received a 100% satisfaction score from attendees of her most recent webinar with 100% saying they “strongly agree” that they would recommend her webinar to a friend. I am always confident that Dr. Goodwin will do an exceptional job teaching our small business owners about marketing and storytelling. Cathy spoke to the Wharton Alumni Club of Philadelphia, at one of its monthly business networking breakfasts, on the topic of How to Use Storytelling to Market Your Business. Her speech was a big hit! Not only were her remarks very interesting and thought-provoking, but she peppered them – not surprisingly – with several entertaining stories of her own regarding her success in counseling a number of small business clients in how to effectively incorporate storytelling into their marketing efforts. The audience was very attentive, asked a lot of good questions, and gave me a lot of positive feedback about Cathy’s talk after the event. Cathy has a unique take on storytelling and a gift for lively humor. I would not hesitate to recommend her to any group looking for a speaker who can combine useful information with a strong speaking style. “I attended the Biznik “Toot Your Own Horn” event that Cathy Goodwin co-hosted with Howard Howell. “Cathy, your workshop on “How to Increase the Marketing Potential of Your Website“ was a great success!